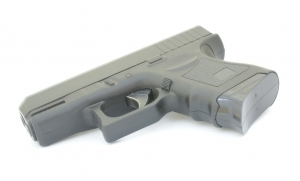 According to an article in the MetroWest Daily News, Framingham police found a loaded gun on a seventeen year old boy following a traffic stop last week. The article states that a police officer was attempting to pull over a car when the defendant, who was driving a different car, failed to pull to the right and get out of the officer’s way. The officer then decided to pull over the defendant. The defendant came to a stop, exited his vehicle, and reportedly “tried to talk his way out” of the situation. According to the officer, the defendant was “nervous and argumentative,” and kept “fidgeting with his hands in his pockets.” The officer reportedly told the defendant to show his hands, but he did not cooperate, and repeatedly asked the officer to let him go home. During the exchange, the teen reportedly took off running. The officer gave chase, apprehended the defendant, and placed him in handcuffs. Additional officers arrived and searched him. During the pat frisk, the police recovered a loaded Smith & Wesson semi-automatic pistol in the defendant’s waistband. The teen was charged with carrying a firearm without a license, possessing ammunition without an FID card, resisting arrest, possession of stolen property over $250, disorderly conduct, unlicensed operation, speeding and failure to yield to an emergency vehicle. Although these charges are unquestionably serious, the defendant does appear to have a strong argument that the evidence recovered as a result of the search should be suppressed. A motion to suppress is a written request by a defendant asking the court to keep certain evidence from being introduced against him at trial because that evidence was obtained as a result of unconstitutional or illegal police activity. The Fourth Amendment to the United States Constitution guarantees a person’s right to be free from unreasonable searches and seizures. For the police to seize a person, they must have reasonable suspicion to believe that the person has committed, is committing, or is about to commit a crime. Under Massachusetts law, pursuit constitutes a seizure. Further, for the officer to pat frisk a person, he must also have a reasonable apprehension that the person is armed and dangerous. If the police lack the requisite reasonable suspicion and/or reasonable apprehension of danger, any evidence recovered as a result of the seizure and subsequent pat frisk should be suppressed. Here, the officer pulled the defendant over for a traffic offense. Although the teen behaved somewhat oddly following the stop – exiting the vehicle, fidgeting, and arguing with the officer – this behavior may not rise to the level of reasonable suspicion under Massachusetts case law. Specifically, the Supreme Judicial Court has recognized that nervousness or fidgeting are not sufficient to warrant reasonable suspicion. Further, flight alone is likewise insufficient. In addition to the fact that the teen appears to have a convincing argument that the police lacked the requisite reasonable suspicion, he also appears to be in a strong position to argue that the pat frisk was unwarranted because the police officer lacked the necessary reasonable apprehension of danger. Although the Commonwealth might argue that the defendant refused to take his hands out of his pockets, this is unlikely to prove to be enough, as it is just one factor among many. Namely, other than the fact that the teen had his hands in his pockets, it is possible the police lacked any other basis to suspect that he was armed; the officer did not notice any bulges in the teen’s clothes, did not observe his pockets to be heavy, and did not observe the teen make any gestures to indicate that he was carrying a weapon, such as adjusting it’s position, or checking to make sure it was still in place. Regardless of the strength of any motion to suppress that might be filed, however, these are very serious charges; the gun charge alone carries a minimum mandatory sentence of eighteen months in the house of correction, or two and a half years in state prison. The defendant is unquestionably in need of an experienced attorney to evaluate the evidence, research the relevant law, and persuasively argue the motion to suppress to the court. Attorney Daniel Cappetta is well versed in search and seizure law and has successfully litigated numerous motions to suppress. Call him for a free consultation today.